Lots of work has been continuing in NAB in general and this site in particular, as you'll know if you visit the "News Update Channel" over at the Nerf Arena Forums! We have added quite a few new screenshot & review pages; let's start with the least exciting ones, maps that Tmon & Tux have on their downloads pages that had somehow not come my way. Playground, The Map and DH Lighted No Guns Beta 1 are all anonymous efforts, while Stadium is a preliminary version of Tracer's Stadium '01, and Kosov Remix seems to be an unfinished project by Sharpknux. WolfPack Training Beta is a new, improved version of G.Wynn's first map-making attempt, which was WolfPack Training Map - the major improvement is that it now has a proper skybox, though it has been improved in other ways too. His second map is Cavern, and his third is Barracuda Complex...check them out, you won't regret it. "Triple Strike",the NAB serial by Icephoen-X, has now been completed - read the whole story on this page, below his earlier "The Problem With NerfEd", okay? Long-time nabber Tweety has been playing recently, and running a server; he is also working on a map called Tweety's Big Tree - he sent us a screenshot! He has gone off to Mexico for a month now, though. Justin has been in touch to say that, after being busy with his Gamecube, he has now given up NAB for Lent - but should be back with us after that, which is good news. Flame is working on a number of maps, including an "Assault" version of Overlord Remix, plus Arxona and Archipel. His map Brotherhood of Fire is out, on the Star Wars Clan site - it's a nice one! Laser Blast, and Icedude's King of the Hill mod. And if you download Ace's "Nerf PDA Menu Mod" as well, the two game-types get added to the drop-down menu you use when making a server, along with pointblast, ballblast, speedblast, and the team versions. Ace describes the mods nicely - let me just say that they are small downloads, and a lot of extra fun. Highly recommended! Tiggy seems to have stopped work on the CTF mod, but he has passed the code on to Curt and Ace. Curt is working on a map called Assault Barracks - check out the NAB'n'UT site for some screenshots of models he has made for it. As with Flame's project, the idea is to try to give a taste of the UT "Assault" game type...The "Previews" section also has some interesting shots of SLAM's Nerf Hall work-in-progress. supposed to be four times as powerful. The graphics card doesn't seem too happy with some NAB and UT texture effects, which is a worry - Quake III Arena seems to work beautifully, though! Not wanting to import some of the old machine's faults, I've been down- loading the NAB maps onto the new computer, mainly from Tmon & Tux's site - but some I've been able to download from my own site, which is nice. Anyway, see you on NAB soon! SLAM has gone off to "Boot Camp" for the Coast Guard, leaving us with one of his most ambitious maps yet: Nerf Hall! The map is 9.29MB (2.92 when zipped), and it uses the quake3a and SLAM_Natural texture files - there's some very impressive architecture to be seen, although some parts of the main house are not yet finished. SpUtNiK intends to do some more work on his Beachhead Assault map; BlobBlob has released Jungle GravBall, using Icedude's "GravBall Template" - it's still a cute variant of ballblast, now with added Tobio trees! Tweety has released his Tweety's Big Tree map, a nice simple playing arena and a breath of fresh air after all the UT remixes and look-alikes of recent months; his server is a very popular playing location now, after the disappearance of the Thunder Clan Dedicated Server. "My system admin has recently placed a firewall on the Internet lines at work because of the people sharing files via audiogalaxy, and the likes," Policer_O reports. "The firewall keeps the server from being seen from the Internet. I can still see it anywhere on the LAN at work though. So, it seems that until I can convince or coerce my system admin into giving the server a hole in the firewall, we will not have the TC Dedicated Server." Two months without news? Well yes, basically. One other map did come out, as foillowers of the "NEWS UPDATE CHANNEL" will know: Bolt Remix , a small but cleverly designed map, brought to NAB from UT by Darth Animal - who swears he has tried to do other remixes, but had various problems he has yet to overcome!. The last few times I've tried to visit, Tiggy's BLAST ZONE site has not been there, which is worrying. Boom promises that he's returning to NAB now that summer is here; Flame seems unable to reinstall NAB on his computer at the moment, though he hopes to manage it in a month or three. BlobBlob has had bad computer troubles, but should have a new home-assembled machine soon, to let him play at a better frame-rate. Now that SLAM is back, though, things will happen - other new maps, and hopefully the release of the map he started, and Curt has worked on, called Base Warefare apparently! And, since I began this update, I've discovered that Curt has released a final version of his Dragon's End map - a straight-to- download (927kb) link is here! I did take a screenshot, but it was almost exactly the same angle as the one I took in the Beta version, which you can still view here... Anyway, it's good to be back! Not one, but two excellent new maps set inside pyramids have been released recently; there's Khufu by Tiggy, closely followed by 1-on-1 walking amongst us by Curt. There's more "eye candy" in Curt's map, and the "boingiest" bouncer you could hope to jump off, but they both look like must-haves, and they both first became available to people who keep up with the NAB Forums. Our reviews and screenshots are up, now - just clicking on the names should take you there, where you'll also find "download now" buttons. Revised or new reviews are now up for Charlotte, CrashSite Beta 2, Crypt, Lonely Isle, SLAM's Ruination, and Trip in the Head - so check them out! GWynn's Crypt suffers from over-use of UT sound and texture files, so while the map itself is a small download, you could be looking at adding 20MB of files to your NAB installation, which would be bad news. If you've already got them, fine, add another 1.5 to the RR! What with those files and the ones that Charlotte demanded (ones I must have had on my old computer, and would need to run some other NAB maps, so I am glad to have them! ), I had a lot of "can't open package" messages trying to start NAB that day... Lonely Isle by Tiggy is still at the "demo" stage, just a nice place to chill out with no weapons; Charlotte and Trip in the Head by Tracer are finished versions of previously-previewed maps, to mark his return to NAB. The second beta of CrashSite from Icedude is certainly worth your time, much advanced on the previous version, and complete with some "civilian" (non-fighting) Bots. And of course the SLAM map, Ruination, looks great, plays excellently, and even has some hidden goodies, so you need it, okay? There's a new website from jt487 to add to our links, and also a general gaming site Curt is involved with, BroadbandGO - so check them out, okay? We have posted reviews of Tiggy's recent two maps now, Ascension and Ciguatera - and we welcome a new mapmaker, whose Manato's Nerf Page has been added to our links on the "Planet NAB" front page here. He's no Tiggy or SLAM yet, but our reviews and screenshots are now up, for Castle Run, The Run, Fun, Long John, and Fun 2 - though the last of those seems to run on the NAB demo rather than the 1.2 full version, at least for me! Well, there have been a few new NAB maps since our last update, as followers of the Forums will be aware - Chris has given us such goodies as Desert Storm, Foam Factory, Lava Center, Railroad, and, now, Fortress - some nice work there! And Sahib is providing two servers for our on-line playing pleasure, so visit his site for details of the maps you need to have if you are going to play there...as usual, almost all the map downloads you need are on the Tmon & Tux site; they've recently added the above-mentioned maps by Chris, which is good! You can normally find download links on our own review pages as well, though on older maps, the links may no longer be active, in which case, head for Tmon & Tux. But the main news today is that Ace has released his CTF mod for NAB, along with one map to start us off, CTF-Hall of Giants Remix! This is the link you need, so what are you waiting for? "Capture the Flag" is a very popular game in Unreal Tournament and other fps games - and now at last we have it on NAB too! The bots don't, at the moment, seem to get the idea of how to play it, but online it should be great multiplayer fun. Capture the enemy team's flag, by taking it to your home base, and score 2500 points! Other maps should follow very soon - SLAM had a number desgned and ready, he'll just need to insert Ace's code and they'll be ready for release...so keep checking here, or on the Nerf ArenaBlast Forum, okay? There have been a number of maps released since our last update - quite a few of the old favourites have been remixed to run on Ace's CTF mod, for a start, and the best way to check on those is to run over to Sahib's Place and look at the list he's running on his dedicated CTF server, 29 I make it! A number of these were done for the first version of CTF, as opposed to the improved 2.0 version, and you may find that characters spawn at the wrong ends sometimes, but it all adds to the fun. Both versions of the mod are here. CTF-2Pyramids ][ Remix by Darth Animal, and CTF-Highlands and CTF-Techcomb1.by SLAM. There are some excellent arenas in there, so check out the links! 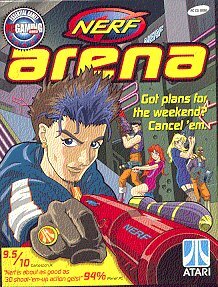 Nerf Arena Forums to see what we are all up to. The number of NAB servers online is much improved over how it used to be, thanks to Sahib and one or two others, so if you've not checked out the online situation for a while, you may be surprised. If nobody is online when you look, well, Sahib's servers do have bots to play against, so play them for a while and, with any luck, other players will see and join you!